Over spring break, Andrew Cheatham, a master’s student at Liberty Baptist Theological Seminary, was asked to train students in Kentucky in disaster relief after tornadoes left heavy damage. 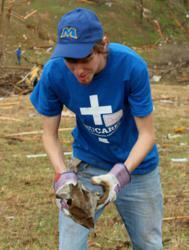 Andrew Cheatham helps with disaster relief in Kentucky after tornadoes left heavy damage. Over spring break, Andrew Cheatham, a master’s student at Liberty Baptist Theological Seminary (LBTS), was asked to train students in Kentucky for disaster relief after tornadoes left heavy damage. Cheatham oversees Liberty’s CampusSERVE, a group that meets every Saturday at Liberty University to perform service projects. One of the group’s most recent projects was helping a local family clean their home. The project was so extensive that it gained local media attention. Cheatham was also among a group of more than 300 LBTS and undergraduate students who went to New York in September with the Southern Baptist Convention (SBC) Disaster Relief group, helping communities recover after a series of massive floods. They performed “muck outs,” where they went into houses and cleaned out toxic mud, tore out walls and cleaned up in some very hazardous situations, and as a result they gained opportunities to share the gospel with many of the homeowners, who were extremely grateful for their work. Cheatham described the experience as “overwhelming,” when he saw not only the level of destruction that was caused by the floods, but also the level of desperation from the residents. It was the first time Disaster Relief had called on a group of college students to help. The organization is the third largest disaster relief effort, next to the Salvation Army and the American Red Cross. The Liberty students’ work did not go unnoticed as the group called Liberty again in February to ask for two student volunteers who could help train other college students in cleanup efforts in the aftermath of tornadoes that ripped through Kentucky earlier this year. “Andrew was the first person I thought about,” said Dr. David Wheeler, director of Liberty’s Center for Ministry Training, upon receiving the call for help. Cheatham joined fellow student Reuben John, who had also done relief work in New York, and the two spent their spring break training students from Morehead State University, in Morehead Ky.
Cheatham described receiving the call as “extremely humbling” and considered it a high honor to work on the project. They worked in West Liberty, a town that, according to Cheatham, was “wiped out completely.” When he and the students arrived it took their breath away to see how devastated the town was, he said. Cheatham and John worked with an average of 100 students a day, the majority of which came through the Baptist student ministry at the Morehead State campus, about 2.5 hours from Louisville. Cheatham was also the first person Wheeler hired when he became the director for the center, asking him to head up not only CampusSERVE, but also the LBTS Block Party ministry, and to help with other public outreach opportunities at the university. According to Lew Weider, director for the Center for Christian/Community Service, Liberty students contributed almost 300,000 hours of service in Lynchburg and surrounding communities in 2011. Liberty University, located in Lynchburg, Va., is the world’s largest Christian university. More than 12,500 students attend classes on its 6,500-acre residential campus and more than 70,000 study in its thriving online education program.